Headquartered in Anchorage, the Alaska Railroad serves more than 500 miles of routes throughout the state, offering excursion cruise packages transporting commuters to local attractions such as Denali National Park, the Alaska State Fair, and the tourist areas of Anchorage, Fairbanks, and Seward. The history of railroads in Alaska dates back to 1903, when the Alaska Central Railroad constructed 51 miles of rail line connecting Seward to the upper Turnagain Arm area. The line was purchased by the Alaska Northern Railroad Company in 1909, which extended its route 21 miles to the north. Government control of Alaska’s railroads began in 1914, when President William Howard Taft authorized the purchase of the Alaska Northern Railroad, and later, the Tanana Valley Railroad, which operated a line between Seward and Fairbanks. Operation of the expanded state railroad was under the control of the United States Department of the Interior until 1967, with the creation of the United States Department of Transportation and the Federal Railroad Administration agencies. In 1985, the railroad was purchased by the state of Alaska for a price of $22.3 million. Since the purchase, the state has facilitated major renovations of the railroad’s lines and proposed several future expansions, including a commuter rail service, a connector to the contiguous 48 states, and a line running between Fairbanks and Delta Junction, which broke ground in 2011. Today, the Alaska Railroad is designated as a Class II railroad and is the only rail system in the United States that carries both passenger and freight lines. The railroad’s mainline extends more than 470 miles throughout the state, with several branch lines providing additional service to various cities and tourist destinations. Three rail barges at the Port of Whittier currently provide a connection to the contiguous United States via Seattle’s Harbor Island. The railroad serves as a major tourist attraction for the state, particularly during the summer months. On most routes, passengers may choose between two travel class experiences, GoldStar Service and Adventure Class. GoldStar Service is notable for its unique open-air upper-level viewing platform, the only platform of its kind on any commuter rail service in the world, as well as its glass-domed ceilings on its lower levels. Passengers may access a full-service dining room, along with a private bar and two tickets for complimentary alcoholic beverages, and narration is provided by tour guides at all points of interest along routes. In Adventure Class, a Vista Dome car provides opportunities for open seating, and free travel to open-air vestibules located between cars allows for fresh-air photo opportunities. A Wilderness Cafe on board offers full dining and bar service. The railroad’s Coastal Classic Train, named one of the top 10 train rides on the continent by National Geographic Traveler, offers daily service from May through September between Anchorage, the tourist attractions of Seward, and the Kenai Fjords National Park area, providing notable scenic views along the backcountry wilderness outside of Turnagain Arm. 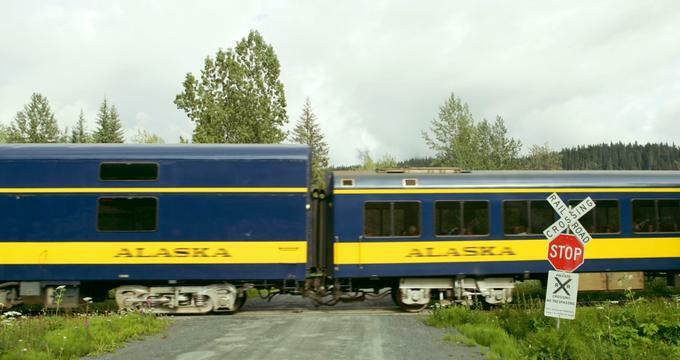 The Denali Star Train, which provides service between Anchorage and Fairbanks with stops at Denali National Park, is the railroad’s flagship line, winding 356 miles through the Alaskan countryside. A Hurricane Turn Train offers flagstop service at any point during its journey between Talkeetna and Hurricane, providing access to hunting, fishing, and backcountry cabin getaways. The Aurora Winter Train runs weekend service and select midweek routes during the winter months, providing access to cold-weather events such as the Iditarod Sled Dog Race and the World Ice Art Championships. Short day trips between tourist destinations such as Whittier and Spencer Glacier are accessible via the two-hour Glacier Discovery Train, which offers onboard views of Alaska’s Railbelt. A number of special event trains are offered annually, themed around holidays and vacation seasons. A Fair Train operates on weekends during the Alaska State Fair, transporting passengers from Anchorage to the Palmer fairgrounds. An annual Ski Train travels to Curry for cross-country skiing opportunities, offering music and dancing along the way inside a polka car. Two beer-themed trains are offered as part of Oktoberfest festivities, serving brews from HooDoo Brewing Company and the Glacier Brewhouse along their journey. An Easter Train offers family-friendly holiday activities such as a magic show and appearances by the Easter Bunny. In October, a Kids’ Halloween Train provides costume opportunities for families, along with Halloween-themed games, craft activities, and magician shows. The annual Alaska Railroad Holiday Train features holiday carolers, a children’s coloring contest, and a visit from Santa Claus. A variety of excursion packages are offered, including a Taste of Alaska cruise, a five-day excursion highlighting the state’s most famous sights, an Alaska Wildlife Safari excursion, and an Active Alaska Adventure package, offering rafting, ziplining, and backcountry hiking opportunities. Group tour packages are available for groups of 15 or more, including packages for business travel through the Meeting Incentives for Conventions and Events program.